An affiliate program is one of the most powerful ways to boost traffic to your online store. With well-organized affiliate program, you can gain increased traffic and sales, generate qualified leads, extend your brand awareness, and get better search engine rankings. 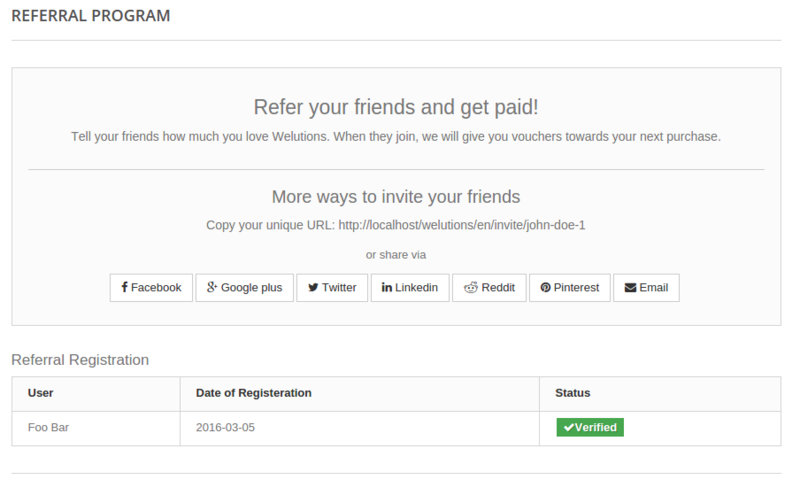 The module Welutions Referral Program let your business to reach more number of customers with the help of your valued existing customers. This helps you to give attractive offers to your customer for every customer who reffered by the customer with their unique referral URL. Social card for facebbok, twitter, google plus and also for other leading social network sites. Add value to existing voucher if it is unused. Every existing customers can acces their referral page from their my account section by clicking the link Referral Program. Once customer reached referral page, he will have option to share his unique referral URL. He can copy and paste the URL on social media platforms or he can use the sharing buttons. Once a user visiting the unique URL, he will redirect your online store’s registration page. System will send a confirmation to email to new customer once he registred successfully. User must confirm his registration inorder to account this against the referrar.